Teesha grew up in Ft. Lauderdale, Florida the daughter of Jamaican parents. She has undergraduate degrees in Psychology and Criminology, and a Juris Doctor, all from the University of Florida. Teesha practiced law for nearly seven years before leaving the practice for full time ministry in 2013. She worked for one of North Point Ministries’ Atlanta area churches, Buckhead Church, equipping leaders to rethink evangelism. She is now pursuing an MDiv at Fuller Theological Seminary in Pasadena, California where she lives with her husband, Fred. Teesha is passionate about issues of justice and calling on Christians to faithfully engage in the work God is doing in the world. She serves as the School of Theology Student Representative on the All Seminary Council (my seminary’s equivalent of student government), advocating on behalf of student interests with the administration. She also works for Fuller Seminary on a grant project involving innovation and vocation. 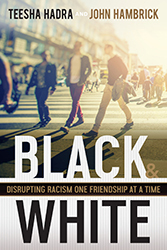 Teesha has co-written her first book with John Hambrick, titled: Black and White: Disrupting Racism One Friendship at a Time (Abingdon Press, 2019).